Anglicans and Roman Catholics should see in each other “a community in which the Holy Spirit is alive and active,” the latest communiqué from the official ecumenical dialogue between the Anglican Communion and the Roman Catholic Church says. 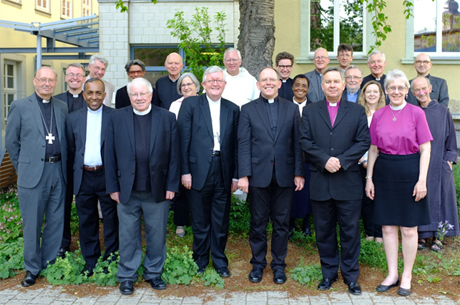 Members of the third-phase of the Anglican-Roman Catholic International Commission (ARCIC) met in the central German city of Erfurt early this month for their seventh meeting. They chose to meet in the city to mark the 500th anniversary of the Reformation – it is here that Martin Luther was ordained and lived as a monk. During their meeting, the members of ARCIC agreed the text of a new statement looking at Anglican and Roman Catholic ecclesiology. Walking Together on the Way: Learning to be Church – Local, Regional, Universal, to be known as The Erfurt Document, will be published next year. This first formal statement to be agreed in the third phase of the ARCIC discussions addresses the structures and decision making processes of the two churches; and explores church order and the maintenance of communion. It paves the way for the work on ARCIC’s next statement, which explores how the church discerns “right ethical teaching” at both a local and universal level. The statement agreed this week asks the churches to consider where they are in need of reform; and then to ask what they can learn from their ecumenical partner. ARCIC anticipate that the Erfurt document, Walking Together on the Way: Learning to be Church – Local, Regional, Universal, will be published in 2018.